It may be in its 44th year, but the Lakes Hospitality Trade Show is shaping up to be the biggest yet with a record-breaking 140+ exhibitors now signed up for the event. It’s also been revealed that a series of free workshops and seminars will feature a topical Brexit-themed debate just two weeks before the UK’s planned departure from the EU. Momentum is building for Cumbria’s longest-running trade show, which will bring together a diverse range of hospitality businesses from across Cumbria, Lancashire and Yorkshire at the Junction 36 Rural Auction Centre on Wednesday 13 and Thursday 14 March 2019. For the second year running, the Lakes Hospitality Association (LHA) is teaming up with Cumbria Tourism to stage the event, which this year coincides with the final countdown to the Brexit deadline. Cumbrian hotelier and Director of the Lakes Hospitality Trade Association, James Tasker, says, “Businesses are telling us that Brexit is the hot topic they cannot ignore, so we’ve decided to stage a special panel debate as part of the show where businesses can explore how Brexit might impact them. That includes the steps they can take to maximise the positives and minimise the negatives. 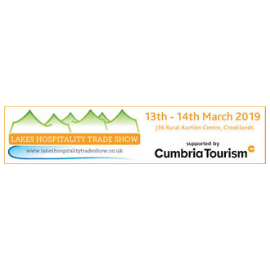 Attendance for the 2019 Lakes Hospitality Trade Show is free and delegates can book ahead for the workshop sessions, including a place in the audience for the Brexit Panel Debate at 10.30am on Wednesday 13 March.